Santa was in a hurry and Claudette Jacquard (from St. John, New Brunswick, Canada) wanted a picture, so Santa grabbed her hand and led her to the water for a quick picture. Forget the old image of reindeer toting Santa Claus and his deliveries through clear blue skies. St. Nick chose to arrive by canoe on Waikiki Beach Saturday, in front of the Outrigger Waikiki. Welcomed by visitors and residents alike, he greeted those relaxing on the beach before heading into the hotel's stores to say hello to employees and shoppers. Santa found time to chat with the Travel Channel TV crew, and even he took part in the hunt for good deals, making a beeline for the Swatch shop, among other stores. He also crossed off a couple of other items on his to-do list -- like a last-minute haircut at Mario's Hair Salon. As Santa walks Waikiki Beach, he's interviewed by the Travel Channel TV crew. 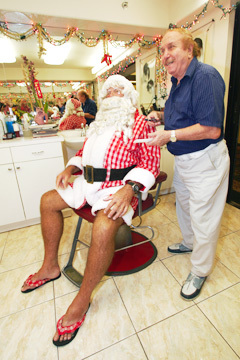 Inside the Outrigger Waikiki hotel, Santa stops by Mario's Hair Salon, left, jumps into a chair and jokes with Mario Fiore that he needs a trim before Christmas. Santa arrived at the Outrigger Waikiki in an outrigger canoe and posed for pictures with visitors as he roamed the beach and the hotel grounds. 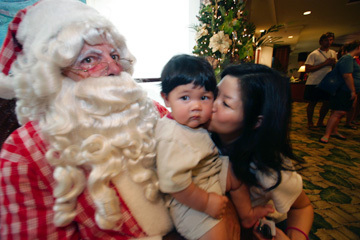 Terri Koron tries to get her 10-month-old son, Alex to smile by giving him a reassuring kiss as he sits on Santa's lap (complementary pictures were taken with anyone that wanted a picture with Santa at the hotel). 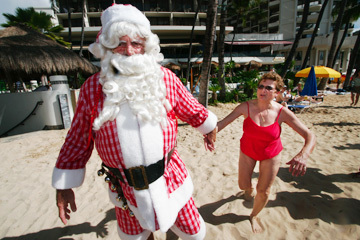 Santa is rushed by Sandi Rios, above left, and Corey Cruz so they could take a quick picture with him on the beach. 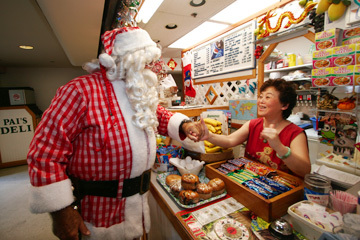 Santa wishes Gloria Pai a Merry Christmas as she stands behind her counter. 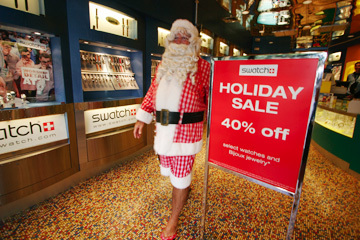 It looks like Santa went shopping, left, taking advantage of the sales as he exits the Swatch store after wishing the employees a Merry Christmas.